We're working to improve visibility in national parks and wilderness areas. We monitor air quality and develop strategies for returning visibility to natural conditions by 2064. Our initial strategies focus on large industrial sources of air pollution and how forestry debris is burned. Measurements show that visibility at Washington's scenic areas has improved over the past two decades. Have you ever looked out expecting to see a breathtaking view of Mount Rainier or the North Cascades, and been disappointed to see an ugly brown or white haze ruining the view? It's called "regional haze," and it's air pollution. Regional haze has reduced scenic views in national parks and wilderness areas from an average of 140 miles down to 35-90 miles in the Western U.S. In the Eastern U.S., visibility has decreased from an average of 90 miles down to 15-25 miles. Haze is caused when tiny particles in the air absorb and scatter sunlight between the object we are looking at — such as Mount Rainier — and our eyes. More particles in the air means that more light is either absorbed or scattered, reducing the clarity and color of what we see. Comparison of a clear day and regional haze. The particles that cause haze come from both natural and human-caused sources. Natural sources include windblown dust and soot from wildfires or other burning. Human-caused sources include motor vehicles, electric utilities, industrial fuel burning, and manufacturing operations. Haze from these sources can come from as far away as Asia. Some of the particles that cause haze are emitted directly to the air. Others are formed from gases, such as sulfur dioxide and nitrogen dioxide, that can be carried far from their original source. This is why haze is often seen in areas that don't have any major sources of air pollution. Fine particles have also been linked to serious health problems and environmental damage. The Federal Clean Air Act requires states to protect and improve visibility in national parks and wilderness areas. The Clean Air Act has a goal of returning visibility in these areas to natural conditions by the year 2064. 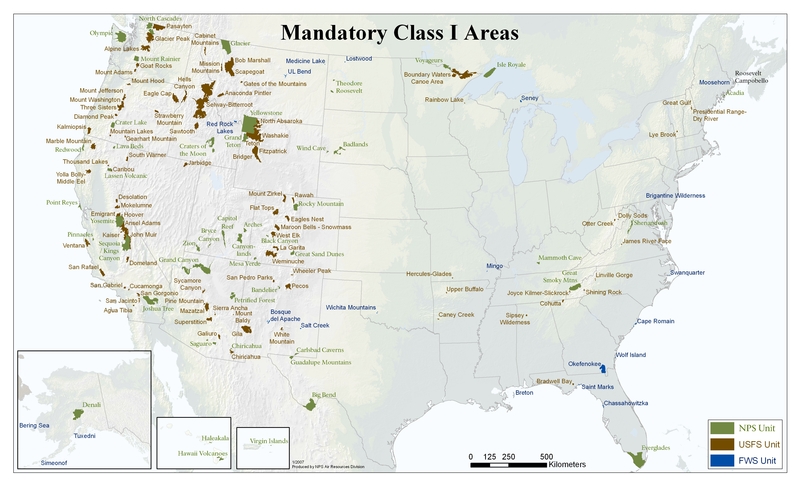 Congress designated 156 national parks and wilderness areas as "mandatory federal Class 1 areas" where visibility is especially important. All states must submit plans to EPA to reduce air pollutants that affect visibility in their mandatory Class 1 areas. Washington's eight Class 1 areas. We measure visibility by collecting and analyzing particles in the air as part of the Interagency Monitoring of Protected Visual Environments (IMPROVE) monitoring network. We do this in partnership with the National Park Service and U.S. Forest Service. In Washington, there are nine IMPROVE monitoring sites. One 24-hour air sample is collected at each site every three days, providing up to 121 samples each year from each site. Once the samples are collected, they are analyzed for substances such as sulfate, nitrate, carbon-containing particles, sea salt, and dirt and sand, all of which affect visibility. We calculate visibility based on the types and amounts of substances in the particles. Visual range (the number of miles or kilometers the naked eye can see). Deciviews (the number on a visibility index where the higher the number, the worse the visibility). A change in visibility of two deciviews can be noticed by the human eye. A measure of light scatter using an instrument such as a nephelometer. Long-term monitoring trends suggest that visibility is improving somewhat at Washington's national parks and wilderness areas. A regional haze State Implementation Plan (SIP) was created in 2010 to define a strategy for improving visibility in our Class 1 Areas. Through the Western Regional Air Partnership, we worked closely with other states and organizations to write the SIP. This plan documented existing conditions and identified key sources of air pollution. The SIP noted that retrofitting emission technology at large industrial sources and existing federal and state controls are important for making reasonable progress by 2018. Updates to this strategy will occur periodically. In 2011, as a result of a 2010 law (Chapter 80.80 RCW), a significant step was achieved in reducing regional haze when the TransAlta power plant in Centralia agreed to install nitrogen oxide reducing technology on two coal boilers.